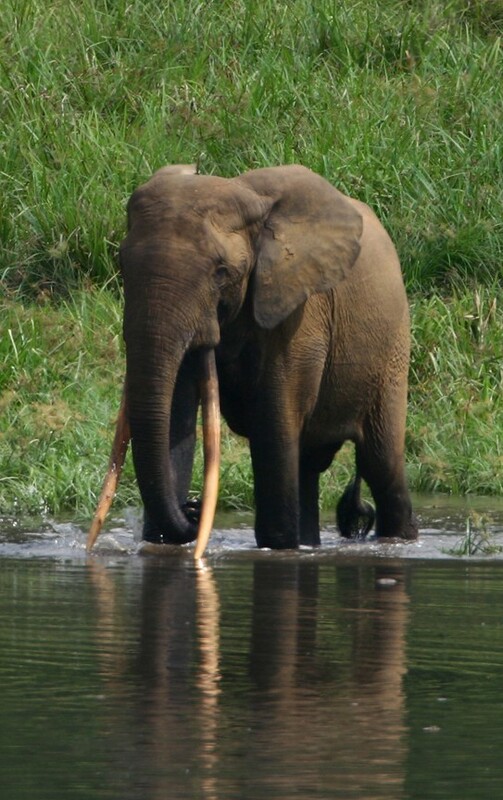 We received some exciting news from Nouabalé-Ndoki National Park in the Republic of Congo! The Republic of Congo has adopted a National Action Plan for Elephants (NAPE), which is a ten-year plan for conserving the population of African elephants in the state!³ ELP has been working in the park since the Fall of 2017; researchers have placed 50 recording units to listen for elephant vocalizations and gunshots with the goal of understanding elephant densities and how to focus anti-poaching resources. On August 3, 2018, just over a week before World Elephant Day, the Republic of Congo adopted its National Action Plan for Elephants (NAPE) after two years of its’ creation.⁴ Based on the principals and ideas of the African Elephant Action Plan (AEAP), NAPE creates a tailored ten-year plan to implement strategies for maintaining the African elephant population within the Republic of Congo. It outlines the government’s strategies to combat poaching, to conserve elephant ranges, to reduce human-elephant conflict, and to raise awareness of conservation within local communities. In 2010, the United Nations Convention of International Trade in Endangered Species of Wild Fauna and Flora (CITES) adopted the African Elephant Action Plan.⁶ It was developed to conserve African elephant populations by combating its’ major threats. The goal of AEAP is to sustain and restore elephant populations within the elephant range states by providing a framework for strategizing for the conservation of African elephants. The founders of the plan hoped that the AEAP would facilitate the conservation of African elephants. AEAP encouraged the African elephant range states to develop their own National Elephant Action Plans that focus on some of the priorities addressed. The African Elephant Fund was created to coincide with AEAP to provide funding to carry out the National Elephant Action Plans of each state. Each National Elephant Action Plan can be customized to fit the priorities of each state according to their individual needs. In 1979, 1.3 million elephants roamed in Africa. In just 10 years, over half of the African elephant population was lost due to poaching.² Between 2010 and 2012, an estimated 1,000 elephants were killed for their ivory.⁵ Poaching serves as the biggest threat to the dwindling elephant population. One of AEAP’s main priorities focuses on reducing the poaching of elephants and stopping the ivory trade. Another priority of AEAP includes maintaining elephant habitats and restoring connectivity of the land. Across Africa, elephants are losing land due to human pressures such as logging, mining, and farming. Development on their land limits the historical range of elephants and restricts their access to food and water. Strategies to overcome this barrier include restoring the connectivity between elephant ranges and supporting the management of elephant ranges. More priorities outlined by AEAP include increasing management of human-elephant interactions, increasing awareness of elephant conservation and management in government and in local communities, strengthening the States’ knowledge of elephant management, and encouraging cooperation among states and local communities for the conservation of these gentle giants. Spotlights fall upon the Republic of Congo, as they have taken a leadership role among African States in promoting the conservation of African elephants, over the last five years. From its debut in publicly condemning the ivory trade by burning stockpiles of ivory in 2014⁴, to adopting NAPE this year, Congo brings to life a new era of conservation of African elephants. The adoption by Congo of a National Action Plan for Elephants is an amazing victory for the elephants, and an amazing victory for ELP in Nouabalé-Ndoki. As Congo paves the way for a greater focus on elephant conservation, we hope that other African states will follow in its’ footsteps. ¹ “Congo Launches Its NEAP.” The Elephant Protection Initiative. August 2018. Accessed September 23, 2018. https://www.elephantprotectioninitiative.org/congos-neap/. ² “Elephants of Africa.” PBS. December 05, 2014. Accessed October 10, 2018. http://www.pbs.org/wnet/nature/elephants-africa-poaching-problem/11367/. ³ “Nouabalé-Ndoki National Park °° Monthly Update.” Nouabalé-Ndoki National Park °° Monthly Update — CBFP. August 2018. Accessed September 23, 2018. https://pfbc-cbfp.org/news_en/items/NNP-Sept.html. ⁴ “Securing a Future for Elephants in the Republic of Congo.” Stop Ivory. April 18, 2017. Accessed September 23, 2018. http://stopivory.org/securing-a-future-for-elephants-in-the-republic-of-congo/. ⁵ “Statistics.” Save the Elephants. Accessed September 23, 2018. http://www.savetheelephants.org/about-elephants-2-3-2/statistics/. ⁶ Republic of Congo. UN Environment. Convention On Migratory Species. ADOPTION OF THE AFRICAN ELEPHANT ACTION PLAN. By Burkina Faso, Ghana, Kenya and South Africa. Manila, Philippines: Convention on Migratory Species, 2017. Accessed September 23, 2018. https://www.cms.int/sites/default/files/document/cms_cop12_doc.24.3.3.rev_.1_african-elephant-action-plan_e.pdf.